No Place like RQYS in November! No place like RQYS in November! Social Events Galore: Melbourne Cup, Captain’s Table Dinner, Peter Lehmann Wine Dinner & Commodore’s at Home Dinner Dance! Come one come all for a day of excitement and fun! Experience the thrill of the races by the water – and we’re not talking about seahorse racing. We’re talking about Melbourne Cup day at RQYS! Come straight to the races without leaving Brisbane and enjoy all we have planned, including games, live music, prizes and more! Shane, our Compere, will running a game of Beat the Bookie throughout the afternoon with himself as the Bookie. He and the staff will be handing out lots of “funny money” during the day which can be earned in various ways. 1. For purchasing your ticket. 2. For every drink purchase. Oatley Wines will be attending this year and will host a wine tasting stand in the room. There will also be a fashion parade featuring a wonderful selection from eb&flo. So come down to our little Melbourne in Manly, this Melbourne Cup and experience a day full of fun, full of excitement, (and keep your wallet full while you’re at it). 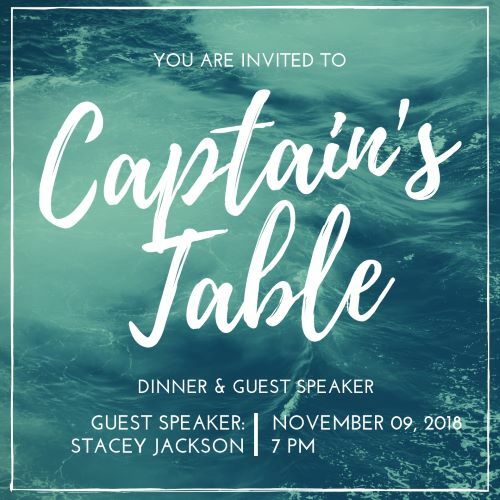 This Captain’s Table will be in a dinner format on Friday, 09 November, making it more accessible for our business men and women who are unable to attend midday lunches. Our Guest Speaker will be Squadron Professional Sailor Stacey Jackson who has recently completed the Volvo Ocean Race for her second time and holds over 15 years of sailing experience including 11 Sydney to Hobarts. Stacey is also passionate about sustainability, as demonstrated through her entrepreneurial activities with NautiBags. Watch this space for more information as details are confirmed, and click here: https://www.facebook.com/Vestas11thHourRacing/videos/1578917298901957/?t=1 to hear more about Stacey and her story! Tickets are $85 per person and includes an hour of welcome drinks, canapes, dinner and petit fours. Contact 3396 8666 or mail@rqys.com.au to book your space at the Captain’s Table today. The Royal Queensland Yacht Squadron is hosting a wine dinner evening on the 27th of September in the Commodore’s Lounge. The evening will consist of 5 courses of canapes with a selection of matched wines from Peter Lehmann Wines in Barossa Valley. Peter Lehmann Wines is an award winning winery that works collaboratively with over 140 growers across the entire region of Barossa to craft a range of premium wines that reflect the decades of experience the talented winemakers possess. Please contact Clubhouse Reception to book your tickets. Commodore Mark & Fran Gallagher invite you to join them at the Commodore’s at Home Dinner Dance on Saturday, 24 November 2018. Dress to impress with the Black Tie dress code, but bring your dancing shoes so you can join the Commodore on the dance floor. Tickets are $85 which includes a drink on arrival and a tapas-style dinner, plus enjoy live entertainment from an excellent Jazz ensemble all evening!